We are writing to express our sincere appreciation for your continued loyalty to our office. We know that repeat customers like you are largely responsible for our great success! If you have already referred patients to our office we THANK YOU! A BIG thank you to those who have already written a review on yelp as well! This is our way of giving back to our most valued patients. We really appreciate you and your loyalty! Maria P. wrote on 8/4/2018 - I have been seeing Dr. Wang since 2000. He's one of the first acupuncturist that set up a business in the 1970's. He cares about his clients. Experience: staff is friendly and Dr. Wang is kind and no-nonsense. He's very professional and I can him miracle worker. I see him for everything. I lived in Italy and would see him yearly for routines when I would be visiting San Diego. Eric W. wrote on 10/30/2017 - Dr. Wang fixed my back within 3 days. Day one all of my pain started to melt away, day 2 the pain dropped by 1/3. Day 3 I had absolutely no pain at all. I plan on going to Dr. Wang for the rest of my life. Dr Wang is a Saint. Nicole R. wrote on 5/26/2016 - Dr. Wang and his staff have been wonderful to work with. I always leave Dr. Wang's office feeling relaxed and have enjoyed getting to know him over the years. 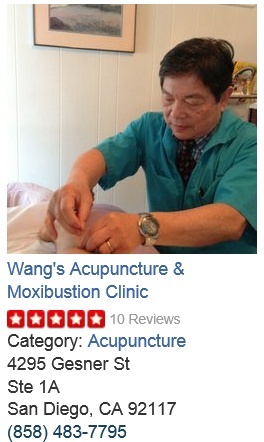 I would recommend him to all of my friends looking for a good acupuncturist. S.H. wrote on 3/24/2016 - I have seen Dr. Wang for 3 separate issues over the course of the last 10+ years. Dr. Wang was able to heal my rotator cuff and back pain when continued physical therapy, cortisone shots, and other forms of treatment could not help. I feel immediately better after each treatment, and he is able to resolve the issue within a couple of months. He is very knowledgeable and I would highly recommend him. Tony T. wrote on 2/16/2016 - Dr. Wang uses more of a traditional approach. His diagnosis is accurate & is not shy about using needles, unlike some other places I've gone to. I always seem to feel better after his treatment. Pete P. wrote on 11/8/2015 - Dr. Wang treats every client with careful attention and patience. His well rounded knowledge of health is incredible. He's fixed multiple issues for me over the years. Kathy M. wrote on 6/27/2015 - Dr. Wang has surrounded himself with wonderful people who make you feel welcomed. they are very flexible and will work with your schedule. Dr. Wang is wonderful as well. You leave there knowing whatever you're there for can be fixed. Varda L. wrote on 6/2/2015 - I have tried several acupuncture providers and almost came to the conclusion that the whole business was a placebo. Then a friend recommended Dr. Wang and was very enthusiastic and convinced that the treatment helped him. I thought that there is nothing to lose and made an appointment. Despite all my skepticism that acupuncture will help me Dr. Wang's treatment helped me and I warmly recommend him to my friends and family. Benjamin S. wrote on 1/30/2015 - But one is a revelation. It's a wonderful kind man with excellent skill. If you have never tried acupuncture or if you have experience with other doctors will be blessed either way. He is a world class healer. I remember one day a bus full of Chinese grandmothers one by one walked to his office this should be testament enough. Read more excellent Yelp Review. Click Here to View Dr. Wang's Resume.